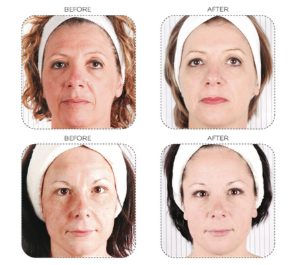 the Neocollagenesis remodeling therapy targets facial lifting and toning of laxt skin using the “Structural Remodeling System” (SRS) device. The Neocollagenesis remodeling therapy treatment is the signature service designed by Douglas using state of the art technology, traditional manual facial methods combined with the power of medical grade active ingredients. The treatment is designed to stimulate and awaken the skins functions, betters skin health, firms skin laxity, tightening and lifts the facial contour by stimulating muscle strength, increases collagen and elastin production. During the session Douglas will customise your treatment to improve your skins condition on that day, as well as target facial lifting and contouring with key technologies. Douglas has developed three levels of treatment for the Neocollagenesis remodeling therapy. The level required is dependent on the clients concerns.